Cheap International Calling: Download Our Mobile App Today! We’re excited to announce the latest update of our mobile application– low-cost international calling at the touch of a button! We listened to your feedback and improved the functionality and connection quality of our mobile app. Download it today and get connected with your loved ones, without the hassle of both access and destination numbers! The holidays are arguably the most family-centric part of the year, with millions flocking home to spend time with their loved ones and enjoy the festivities. With Pure Minutes, your priceless moments don’t have to end with the holidays– they can continue throughout the entire year! Through convenient mobile Top Up and prepaid international calling, you can give one of the most invaluable gifts of all– your time. Connect with your loved ones today and give them the gift they’ll always cherish! Black Friday Blowout: Double Your Purchase! We’re excited to announce our most exciting Black Friday deal yet! For 1 day only (11.28.14), ALL customers will receive double the amount of their online purchase! This means you can stay in touch with loved ones throughout the holidays, without having to worry about breaking the bank! *11/28/14 only. Not valid when combined with other offers. Limit 1 purchase per customer. Are you tired of last-minute recharges for your phone because your account ran low? With the Auto-Recharge feature, you never have to worry about running out of minutes again. When your account goes below $3, auto-recharge will refill it automatically with the amount you choose. All you have to do is go to the profile tab in your account, and scroll down to the Auto-Recharge switch. When you turn it on, you can set how much you want your account to be refilled each time it dips below $3. The best part of auto-recharging is that there’s no obligation or contract- you can turn it on and off at your own convenience with no penalties! Try it today and cross one more worry off your list! We’re proud to offer Pure Minutes users an exclusive new benefit: eligibility for small business loans through Pure Capital Group, the sister company of Pure Minutes. The Pure Capital Group is dedicated to continuing the American legacy of ingenuity and innovation by helping small businesses reach their full potential. When traditional financing is not readily available, Pure Capital Group’s nationally recognized team can help your business to grow, allowing you to focus on what you do best. For more information on how Pure Capital Group can help with your small business dreams, please visit www.purecapitalgroup.com. Feature-rich and low-cost, Voice over IP seems like a great calling option for homes and businesses alike. VoIP can save customers more than 60 percent over the standard Public Swtiched Telephone Network telephone bill, according to a VoIP Systems USA infographic. Some VoIP providers bundle in additional features at no additional cost — including call waiting, call forwarding, call transfers and voice mail — while PSTN providers charge extra for these same features. Yet even as VoIP matures, there are still several disadvantages to consider before taking the leap to this Internet-based phone solution. PSTN services generally continue to work when the power goes out, so you can continue to make calls during black outs and brown outs. Unlike PSTN, which gets its current through the phone line, VoIP service requires a broadband connection fed through the same power lines as other electrical devices. VoIP services usually go out at the same time as the power does, although some providers provide backup systems. Businesses may want to purchase a generator or other backup battery systems so that phone lines can continue to work in the event of an outage. Residential customers will probably find these backup solutions costly. Mobile phones are a good backup solution, as long as you can keep them charged and you have reliable cellular service at your home. Every child knows to call 911 in an emergency. It’s easy to remember and, with PSTN, emergency services can trace the call to the location, so a young child or panicked adult doesn’t have to know the address. In the past, VoIP customers couldn’t be guaranteed 911 service and, even if they did have service, the automatic location services might not work. The Federal Communications Commission now requires that VoIP providers resolve many of these emergency service differences, but some problems still exist. Make sure you discuss emergency services and any differences from PSTN with your provider before making the switch. Voice quality in VoIP systems have improved significantly in the past several years, especially as high-speed Internet becomes the norm. You may still experience voice quality problems, such as garbling and delays or even dropped calls. This concern is salient if VoIP is running over low bandwidth or is competing for resources with other applications on your computer (if you are using a PC-based VoIP solution) or other devices using the Internet. Increasing Internet bandwidth can help in some situations, but if you experience quality problems, you should work with your VoIP vendor to identify and fix the problem. As with any Internet-based technology, VoIP presents security problems that PSTN does not. Identity and service theft, viruses, malware, denial of service attacks, spamming, call tampering and phishing attacks are the most common security challenges for VoIP. Your provider may be taking steps to secure the network on their end — they don’t want to make news with a major security flaw — but businesses in particular may want to take additional security measures to limit disruption of service and financial fallout caused by VoIP security breaches. 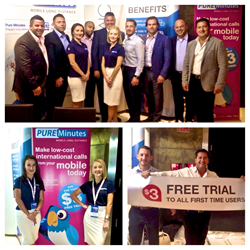 Leading mobile long distance company Pure Minutes is pleased to announce its participation as an exhibit sponsor in the Wholesale World Congress on September 3-4th of 2014 (link). The event, which took place at the famed Meliá Madrid Princesa in Madrid, Spain, hosted more than 240 companies in the wholesale telecom industry. 2014 marks WWC’s 4th year as an event bringing together companies with the motto of “business in action,” allowing those in wholesale telecom to negotiate business for two consecutive days. With a focus in voice and SMS, this year’s WWC saw an increase in the volume of participating companies, spanning over several floors of the Meliá Madrid Princesa. Pure Minutes (link) is a leading prepaid long-distance service for international callers, with a focus on affordability and convenience. Through the Pure Minutes Bilateral Group, the purchasing arm of the Pure Minutes retail division, better pricing and quality are secured through strategic alliances, providing subscribers with high quality at the lowest rates possible. Pure Minutes’ client base is rapidly expanding, with active subscribers generating high volumes of retail voice traffic in all regions of the globe. Pure Minutes is a leading provider of prepaid international long-distance service. We pride ourselves on our affordable communication solution that offers flexibility, portability, and simplicity for both landline and mobile users. With our revolutionary identification system, subscribers no longer need calling cards or complicated PIN codes – and can continue with their current phone providers. We offer competitive international rates with no hidden fees, no maintenance fees, no contract required, and no expiration on minutes. Pure Minutes service is available for purchase on the web and at many convenient retail locations worldwide. Follow us on Facebook (facebook.com/PUREMinutes), Twitter (@PUREMinutes), and LinkedIn (PUREMinutes, LLC) for updates. So, you want to know how to make an international phone call from the USA? Before you make your first international call from the USA, there are a few things you will need to know in order to make a successful phone call. To make international calls from USA, or to make an international call from any country for that matter, one needs to know the international calling prefix for the country from which he/she will be placing the call. The International call prefix is a unique code for each country allowing its inhabitants to make international calls. For example, the USA’s international calling prefix is ‘011’. Next you will need to know the country code for the country to which you will be dialing. Country codes can be in range of 1 to 3 digits. The country codes may vary for some countries depending on whether the call is made from a mobile phone or fixed phone. Further, there are countries which have more than one country code. The next set of digits to be dialed is called the area code or city code. The area code or city code can be anywhere from 1 to 6 digits. Finally, you will need to dial the local phone number to complete your international phone call from the USA. Pure Minutes announces a new way to save on international long-distance that’s as easy as picking up the phone. Pure Minutes provides a low-cost international calling solution that works with any phone number, regardless of the current provider. This means that a user can enjoy the benefits of low international rates without needing to change their current landline or mobile cell phone service provider. Pure Minutes has no hidden fees, no connection charges, real minute rounding and can all be used without annual contract. For a limited time, new users can us the coupon code BIRDISTHEWORD to get a 30% BONUS on their very first recharge! Sign up is 100% free, so begin saving cash on International Long Distance today! Studying abroad? Learn how to save money on International Calls with Pure Minutes! When preparing to study abroad there are many considerations to bear in mind. What kind of backpack to bring, making sure room and board is covered, and making sure to bring the right type of clothing for the season. However, while all of these definitely important, there are some absolutely essential tasks to consider before heading overseas. While many countries advise keeping the original passport on hand, many do not feel safe carrying it as risk of theft or loss increases during holiday. Consider keeping a clear scanned copy of the passport on a smartphone or flashdrive for quick access if authorities or institutions need to view it for any identification purposes. Be warned, official institutions such as banks are unlikely to accept a scanned copy of an official document however for everyday use a scan should suffice. Visit a physician, inform them of the intent of studying abroad, and get any prescriptions filled with an emergency ration along with a copy of the prescription. Certain drugs that are legal in the United States are not legal in other countries, so be aware and check the centers for disease control for a list of prohibited medicines. Without the risk of sounding juvenile, but related to health and well-being, consider a buddy system. When traveling to another country one loses all their support systems. While at home, family or friends may find it suspicious when communications has been lost for a few days and can immediately check in. While visiting a foreign land, the prospects aren’t so great. Family and friends expect delays or loss of communication as their loved ones explore the surroundings with a new group of friends and constituents. As grim as it sounds, checking in with a local on a regular basis and leaving a rough itinerary on facebook may help keep track of a travelers movements. In the off-chance there is an accident, or perhaps it’s a matter of getting lost in an unfamiliar area, someone will be able to figure your location. Sign up for an International Student ID Card (ISIC), membership will only cost $22 but can potentially save hundreds of dollars in participating retailers around the world. The card offers commission free airport currency conversion and potential discounts at museums, restaurants, sightseeing tours, movies and more. Look for a good in-country pre-paid cell phone option because usage charges for United States cell phone providers will be charging long-distance rates. A prepaid calling card used to be the cheapest and most convenient option to make international phone calls however it often required wading through complicated menus and PIN numbers. When overseas it also added the hassle of needing to find a card which had the option of English menus. Today staying in touch with friends and family has never been easier with Pure Minutes. Pure Minutes provides a low-cost international calling solution that works with any phone number, regardless of the current provider. This means that a user can enjoy the benefits of low international rates without needing to change their current landline or mobile cell phone service provider. Subscribed callers simply dial a local access number and through modern “Automatic Caller Identification” software we can recognize a subscribed caller making the need for complicated PIN codes a thing of the past. PURE Minutes is a leading provider of prepaid international long-distance calling solutions. We provide an affordable communication solution that offers flexibility, portability and ease-of-use for both landline and mobile users. PURE Minutes offers competitive international calling worldwide with no hidden fees, no maintenance fees, no contract required, and minutes that never expire. PURE Minutes service is sold on the web and through regional and national retailers including MoneyGram, La Nacional and payXchange and is available to customers worldwide in English and in Spanish and accepts payments through all major credit cards and Paypal. Movistar Campus Party 2014, the world’s largest technology and digital culture fair, drew more than 10,500 participants to its fifth edition in Zapopan, a city in the western Mexican state of Jalisco, organizers said. The massive event, which ended on Sunday, was organized by the Mexican unit of Spain’s Telefonica and several Mexican organizations. For seven days the fair brought together thousands of people with their computers to trade experiences and learn of new cybernetic projects and alternatives in telecommunications and breakthrough technologies. The high-tech event, held for the first time in Zapopan, “peaked with the highest number of “Campuseros” of any Campus Party ever held, not only in Mexico but in countries like England, Spain, Brazil, Colombia, El Salvador and Ecuador,” organizers said. The chief mission of this conference was to instill the entrepreneurial spirit in young Mexican innovators and promote the development of business ideas with the necessary tools and financing, organizers said. Ten Mexican projects and another four from Argentina, Chile and Peru were unveiled for the Telefonica program dubbed Wayra, created to promote and fund new ideas and IT enterprises. The National Entrepreneurship Institute, or INADEM, the Mexican Youth Institute, or IMJUVE, and the Mexican Industrial Property Institute, or IMPI, were among the organizations participating in the event.